You know Nigel Cabourn’s work — he’s the guy behind those reproductions and masterful designs that make you self-justify after you get punch drunk at the pricetag by telling yourself that it’s a jacket for lifeNigel Cabourn gear has been aped by pretty much every inferior brand who wanted a bit of the heritage pie but didn’t have the archive or want to do the research. Newcastle-based and still the nation’s don-dada when it comes to coats (if you were smart you grabbed a Ventile parka in orange from his Debenhams range a few years back). Here at Crooked Tongues, we love a fancy technical fabric, but Ventile is a significant UK innovation that dates back to WWII, as the material of choice for flight suits that protected ejected pilots on contact with the sea to avoid hypothermia long enough for rescue. Cotton fibres puffed up when wet to create a waterproof surface that would return to a breathable state when dry. It protects against wind and water, but it’s resilient too — it sounds quaint, but for a performance fabric to wash with a bit of care without having to fear ruined (and expensive) membrane layers or an elaborate re-waxing procedure makes Ventile still very relevant in the field of jacket construction. Nigel remains defiantly northern-based and Ventile was invented in Manchester, which makes this pretty logical. 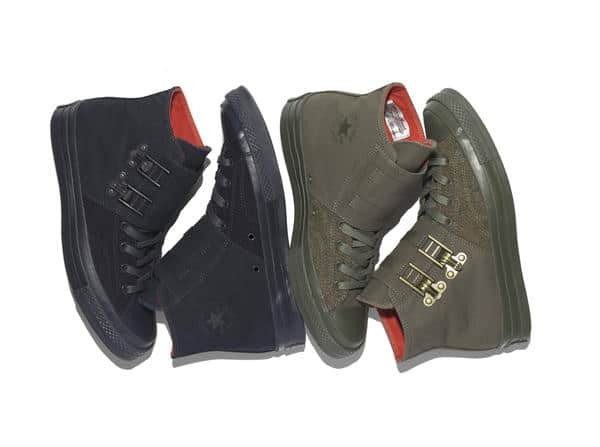 While we save our pennies for the Sealed Ventile Aircraft Jacket from the current collection (which merges Royal Air Force and United States Air Force inspirations), the Converse Chuck Taylor All Star Bosey’s boot-like look, with the D-ring top fastening works here as a militaristic nod. A cotton Ventile upper and stripe sole unit in tonal shades, plus some archive details (because — like we said — Nigel is all about the archive details) makes it fit the whole Cabourn world well. The Chuck might be reworked to look like it’s made for flight, but the Chuck Taylor All Star Speciality Plimsole flips an old world US gym classic into a take on a British training shoe that uses Italian denim on the upper and canvas on the lining — the kind of shoe a new recruit might have rocked as he climbed a rope or scampered over a wall while a barrel-chested man with a moustache yelled insults in his direction. It’s a nice tie-in with Cabourn’s Army Gym line, even if any form of plimsole gives us the heebie-jeebies. Converse called on Mr. Antony Crook to shoot the shoes on location at Duxford’s Imperial War Museum (where one of the CT team once vomited into a lunchbox and caused a school trip to be ended abruptly) — given the WWII airborne history of the place, it makes a lot of sense. The legendary Spitfires entered service with No. 19 Squadron RAF back in August 1938 and they brought the ruckus during the Battle of Britain in 1940. The former airfield location of the museum was part of all that.